HP’s new itty-bitty Microserver, the little server that couldn’t » Welcome to vSphere-land! The list price for this base configuration is $329 but to use this server as a vSphere host you are going to have to upgrade it. There in lies the first problem, only 2 memory slots, the server comes with only a single 1GB DIMM populating the one slot, to get to 4GB of memory you would have to remove it and 2 – 2GB DIMMs, the cost for this is $160. Having only 4GB of RAM in a virtual host is just not enough so to get the server to its maximum supported 8GB capacity you would have to add 2 – 4GB DIMMs, the cost for this is $700 due to the extremely high cost of denser RAM. Now you’re up to over $1,000 for this server as each 4GB DIMM costs more than the server itself. The next problem is the CPU, the AMD Athlon NEO 1.3 Ghz processor is pretty weak to be used for a virtualization. The AMD NEO processor family was designed for ultrathin notebooks and has a very small form factor and low power consumption. As a result while it is a dual-core CPU, 64-bit and includes the AMD-V feature which is required by vSphere the performance is just not going to be good enough for a virtual host running many VMs. There is also the question of if you could even use it with vSphere which may not include the driver for whatever storage controller is being used. HP’s website does not give the model # of it so its pretty much a mystery right now. The embedded NIC is the NC107i which is the same one used in other servers like the ML110 G6 which is supported by vSphere. One would guess they would use the same storage controller as the ML110 G6 which is the B110i which is also supported by vSphere and if thats the case you could at least install and run vSphere on it. I love everything else about the server, especially its micro form factor case, I’m OK with only 2 expansion slots as you could easily add 2 dual port NICs to it for a total of 5 which would be sufficient for a vSphere host. The one downside it both slots are PCIe which require only PCIe cards which are double that of PCI/PCI-X cards, a dual-port PCIe Intel NIC goes for about $130. While its a neat little server with a small form factor that would be great for home labs I just can’t see using it for virtualization running ESX or ESXi. However I can see it being used as a nice little storage server, you could fill the four drive bays with 1TB drives for less than $300 and install OpenFiler on it and have yourself a nice little storage server to use with vSphere. But to use it for a virtual host just isn’t practical or affordable, I really wish HP would make a whole line of these servers and over more options and expandability. The server does have the TPM security chip slot like other HP servers and also a special slot for a out of band management board called the Microserver Remote Access card (purchased separately) which are enterprise class features. If they would only give this server 2 more DIMM slots and provide more CPU choices this server would be perfect for a small virtualization home lab or business. This server seems geared towards running non-virtualized lightweight applications on it which doesn’t make sense when everyone is going virtual these days. So if you’re looking for an affordable vSphere home lab or small business server I’d have to recommend you look at the ML110 G6 server instead. The list cost is not that much more, it starts at $469 and it comes with more DIMM slots (4), more PCI slots (4) and more CPU options such as the Intel Core i3-530 (dual core), Intel Xeon X3430 (quad core) and the Intel Xeon X3440 (quad core w/HT). Also be aware that the Microserver does not come with a DVD drive standard which is an additional $49 option, the ML110 G6 does include a DVD drive. The ML110 G6 is a great little server, it’s taller than the Microserver but just as quiet and has low power consumption. I have two of them at home and they are perfect for a vSphere lab, with 4 DIMM slots you can use affordable 2GB DIMMs and get a total of 8GB of memory. In addition the X3440 CPU has hyperthreading which gives you 8 cores to use with a vSphere host. 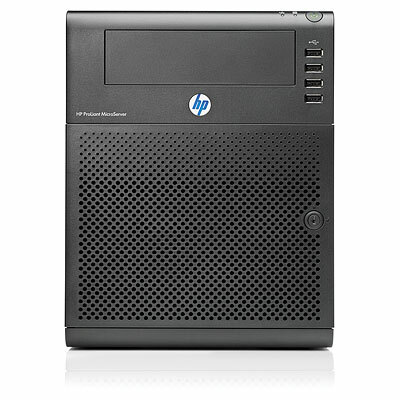 The HP Microserver is a cool concept and reminds me of the Shuttle servers but the small size comes at a cost with HP’s version and it just isn’t a great candidate to use as a vSphere host. Regarding the ML110 G6, are you able to do FT? Would you be so kind as to post your hardware specs or model purchased? All the details are in these articles.